Literally Sports: LeBron James: All Time Great? In any sport, the all-time greats are ultimately measured by their individual success, whether it be in Most Valuable Player Awards, Cy Youngs, World Championships, or Grand Slam titles. With his first NBA Championship, LeBron James moved into a class with some of the greatest players to ever pick up a basketball. From a historical perspective, he has not been as successful as the legends of old, but a modern approach to the subject sheds a much different light. LeBron James, in my opinion, is the greatest athlete of all time. Measurements of his size range anywhere from 6-8 250 to 6-9 270, his vertical leap is greater than 40 inches, and his speed is other worldly. He was a 2-time National Player of the Year in High School Basketball, 2 time All-State Wide Receiver in High School Football, and now he is having the same type of success in the NBA. He might not have the size of Bill Russell, the skills of Magic Johnson, or the heart of Michael Jordan, but his athletic ability is undeniable. The most fundamental skills in basketball are dribbling, passing, shooting, and defending.As far as dribbling, passing, and defending, LeBron is second to none in the NBA today. However, his shooting ability is what holds him back from dominating scoreboards on a consistent basis. Although James averages over 27 ppg for his career, it pales in comparison to Jordan's 10 scoring titles and career average above 30 ppg. The mid-range jumper, at times, is the most imporant shot, because you simply cannot get to the basket every single time. MJ and Kobe both developed go to moves that allow them to score efficiently. Olajuwan (The Dream Shake) and Jabaar (The Sky-Hook) used their post game to develop such moves as well. The "crab dribble" LeBron does to get to the basket, is an invention of the mind, and quite frankly, should be considered a traveling violation. Until LeBron develops a move he can do consistently to get open shots, his perimeter shooting will continue to struggle, and he will regret that in his later years. Intangibles are what define champions. Heart. Hardwork. Determination. The "it" factor. Swag. It has been called many things over the years, but the real question is: "How bad do you want it? " Michael Jordan wanted it so bad that he scored 38 points in the 'flu game' where he had to be carried off the court by Scottie Pippen. Magic Johnson wanted it so bad he played center in place of the injured Kareem in his rookie year in the closeout game of the NBA finals and scored 42 points to go along with 15 rebounds and 7 assists in the Laker victory. LeBron James folded twice in the Finals, but proved his toughness by fighting off cramps to hit the go-ahead 3 pointer in Game 4 of the NBA Finals this year. Overall, it is tough to judge players against each other that played in different eras. Russell's 11 Championships, Jordan's 10 scoring titles, and LeBron's 3 MVPs at the mid-point of his career are all outstanding feats, but they never played against one another, so they are tough to compare. The only thing that is universal is hardware, so I tend to use MVPs and Final MVPs as measuring tools. Only 8 players in the history of the NBA have at least 3 MVPs and at least 1 Finals MVP: Jordan, Russell, Wilt, Kareem, Magic, Bird, Moses Malone, and LeBron. In my opinion, that list is as close as there is to the best 8-man rotation of All-Time. The 8 greatest players in NBA History. "In any sport, the all-time greats are ultimately measured by their individual success..."
"With his first NBA Championship, LeBron James moved into a class with some of the greatest players to ever pick up a basketball." Didn’t you JUST say that all-time greats were measured by individual success? Since a championship is a team achievement, then you’d have to say that LeBron was already in that class. "From a historical perspective, he has not been as successful as the legends of old, but a modern approach to the subject sheds a much different light." Depends on which legends we’re talking about, and how we are defining success. If it’s team success, he’s still looking up at Russell and his HOFers, Wilt, Magic, Bird, Jordan, Hakeem, Kobe, Shaq, and Duncan. If it’s individual success, LeBron isn’t looking up at many players. But you’ve made this confusing by failing to fully define anything. "LeBron James...is the greatest athlete of all time...He was a 2-time National Player of the Year in High School Basketball, 2 time All-State Wide Receiver in High School Football, and now he is having the same type of success in the NBA." I’m not inclined to look any of this stuff up – if you didn’t do your research, why should I? – but I doubt he’s the first guy to have that kind of high school career. I’d bet that more than a few NBA scrubs were all-world awesome back in high school. And yeah, LeBron is a phenomenal athlete, but he’s not unquestionably the best in NBA history, let alone all-time. Is Dwight Howard slow? Was David Robinson? Was Wilt Chamberlain? Because those three guys were/are huge and super-strong. Blake Griffin is like the exact same size as LeBron, and possibly even more explosive. LeBron might be a better player than all of them, but doesn’t stand out in that group as an athlete. But all-time? Have you seen some of the athletic monsters that play in the NFL? Calvin Johnson? Jason Pierre-Paul? Jevon Kearse, back in the day? "The most fundamental skills in basketball are dribbling, passing, shooting, and defending. As far as dribbling, passing, and defending, LeBron is second to none in the NBA today." Second to none on defense? No, but he is a very good defender. Dribbling? LeBron is a competent ball-handler, not outstanding. Passing? Hell yes. It was probably his most fully formed skill coming into the NBA. "However, his shooting ability is what holds him back from dominating scoreboards on a consistent basis. Although James averages over 27 ppg for his career, it pales...to Jordan’s 10 scoring titles and career average above 30 ppg." Pales?? No – 18 PPG pales in comparison to 30.1 PPG. (I like how you use Jordan’s “over thirty” when it’s 30.1; that’s like infomercials that claim “Under $100!” when it’s $99.99) I agree that ten scoring titles is amazing, which no one would dispute. But if you and I are picking teams on the playground and you pick Jordan and his 30 per game, I’m not exactly settling when I get a guy who scores 27. Especially when that guy is as well rounded as LeBron is. LeBron is third in career PPG all time (27.64) behind MJ (30.12) and Wilt (30.07). LeBron "dominates scoreboards" well enough. By winning a championship, I was alluding to his performance in the championship. LeBron was the Finals MVP, and averaged 28,10, and 7. 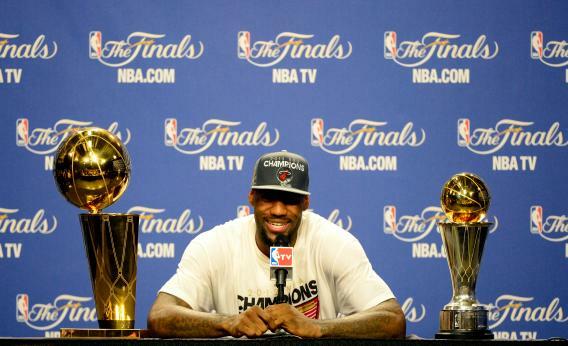 High School success - Three players in NBA history are 2 time national winners: LeBron, Greg Oden, and Brandon Knight. Neither of those players garnered any success in other sports. Athleticism - Being an athlete is not only running and jumping. It is hand-eye coordination, balance, endurance, strength, and flexibility. As far as scoring goes, MJ has had 6 seasons where he averaged more PPG than LeBron's career best 31.4 in '06. And James has 1 scoring title, while Michael won every season he played from 87-98 (10). "High School success - Three players in NBA history are 2 time national winners: LeBron, Greg Oden, and Brandon Knight. Neither of those players garnered any success in other sports." I guess I'm going to have to dig a little, but I'm pretty sure that there were football or baseball players that were excellent HS basketball players. "Athleticism - Being an athlete is not only running and jumping. It is hand-eye coordination, balance, endurance, strength, and flexibility." I probably shouldn't have gone there. I mean, superior athleticism is hard to prove or disprove. I happen to believe that there have been a few players in LeBron's class athletically, but my opinion is no more or less valid than yours. I'd love to see some sort of competition across the NBA, NFL, and MLB to test the best athletes at basic athletic skills. It would be good TV, I think. "As far as scoring goes, MJ has had 6 seasons where he averaged more PPG than LeBron's career best 31.4 in '06. And James has 1 scoring title, while Michael won every season he played from 87-98 (10)." I never said Michael Jordan wasn't the superior scorer. The record makes it plain that he is. But LeBron is not chopped liver as a scorer, 3rd in league history after nine seasons played. I don't think 27 PPG pales to 30 PPG, that's all. "The mid-range jumper, at times, is the most imporant shot...MJ and Kobe...developed go to moves that allow them to score efficiently..."
People say this stuff about the “mid-range jumper” all the time. Folks, it ISN’T OPEN. Unless you’re a player the defense will concede open shots to, mid-range shots are not a panacea. If you’re an NBA elite and you decide to shoot a mid-range jumper, it will be contested. "The “crab dribble” LeBron does to get to the basket, is an invention of the mind...should be considered a travel..."
The vid that you linked to showed LeBron doing a crab dribble on ONE PLAY. I found some other “crab dribbles" – one was from the 1Q of an All-Star Game. And an “invention of the mind”? Huh? Should be a travel? It's basically a jumpstop on one foot. It looks weird because everybody does their jumpstop off two feet. I’d say, call ‘em the same. If the two-footer is legal, so should be the one-footer. "Until LeBron develops a move...to get open shots, his perimeter shooting will continue to struggle, and he will regret that in his later years." "Intangibles are what define champions." Intagibles are what bad and/or lazy writers do to construct a facile narrative. But go on? "...the real question is: "How bad do you want it? "...Jordan wanted it so bad that he scored 38 points in the ‘flu game’ where he had to be carried off the court by...Pippen." MJ was so awesome that WITH the flu, no one could guard him. And Pippen walked him off the floor – he didn’t carry him. Though I now want to rework the classic “Footprints” poem and put Michael and Scottie in it, thanks to you. "Magic...wanted it so bad he played center in place of the injured Kareem in his rookie year in the closeout [win] of the NBA finals and scored 42 points to go along with 15 rebounds and 7 assists..."
"...James folded twice in the Finals, but proved his toughness by fighting off cramps to hit the go-ahead 3 pointer in Game 4 of the NBA Finals..."
LeBron folded once, perhaps. In his first trip, he was, to put it mildly, overmatched. Magic or Michael or anyone else would have taken the loss on that Cleveland team against that Spurs team. Just bad timing. "Overall, it is tough to [compare] players...Russell’s 11 Championships, Jordan’s 10 scoring titles, and LeBron’s 3 MVPs...The only thing that is universal is hardware...Only 8 players in [NBA history] have at least 3 MVPs and at least 1 Finals MVP: Jordan, Russell, Wilt, Kareem, Magic, Bird, Moses...and LeBron..."
Firstly, Bill Russell has zero NBA Finals MVP awards. Secondly, LeBron’s MVPs in mid-career is very much the norm. Virtually no one wins it at the end of their careers, and not many win it in their second or third year. But this list is a hell of a way to exclude Tim Duncan. One man, MJ, has more Finals MVPs than Tim. Only two others, Magic and Shaq, have as many FMVPs as TD. Tim, Magic, and Jordan are the only players in NBA history to win at least two league MVPs and three FMVPs, but Tim is out because he has “only” two league MVPs. Okay. Wanting it - Losing doesn't mean he wanted it less than the year before, but I think in a way it does mean that their opponent (Celtics or Bulls) wanted it more. You tend to take it to the next level as desperation starts to set in. You learn. You grow. You take it to the next level. I wasn't around back then, so I don't know what Magic did back when he was playing. I do know that Kobe stepped his game up in '09 after his loss in '08, Dirk stepped his game up in '11 after his loss in '06, and LeBron stepped his game up in '12 after his loss in '07. A note to Bill Russell - There was no Finals MVP award when he played, but the award is now named after him, so I'd say most of those 11 would be his MVPs. To those excluded - Its impossible to come up with a composite list. If I gave you Kobe, Shaq, Duncan, Willis Reed, and Oscar Robertson I'm sure they could compete well head to head with these guys, its just a system of thought created to include LeBron with the all-time greats. "Wanting it - Losing doesn't mean he wanted it less than the year before, but I think in a way it does mean that their opponent (Celtics or Bulls) wanted it more. You tend to take it to the next level as desperation starts to set in. You learn. You grow. You take it to the next level." One of my favorite quotes about this was Larry Bird after losing to the Lakers in 1985: "We wanted it just as bad as they did. They just played better." I don't disagree that there's something to be said for going through it, having defeat motivate you even harder. "A note to Bill Russell - There was no Finals MVP award when he played, but the award is now named after him, so I'd say most of those 11 would be his MVPs." He only had one opportunity to win it officially, 1969. The writers awarded it to a player on the losing team, Jerry West. West averaged 37 a game in that seven-game loss. Russell was injured during the 1958 Finals, a series the Celtics lost, so unless he averaged 50 points during the series he wasn't likely to win that award since Bob Petit was playing so awesome for the champion Hawks. Writers were impressed first and foremost with scoring average back then, so I think that of the other ten championships Russell won, I'm guessing he would have been named FMVP five or six times. Now, if they had kept track of blocks and steals back then, it would have been eight or nine. Hard to say. Russell had an awful lot of HOF help on his team most years. "To those excluded - Its impossible to come up with a composite list. If I gave you Kobe, Shaq, Duncan, Willis Reed, and Oscar Robertson I'm sure they could compete well head to head with these guys, its just a system of thought created to include LeBron with the all-time greats." What you do is you start with all the season MVP winners. Take a subset of those a group that also won the FMVP. Note all of their all-star game appearances, All NBA appearances, champions played for, give each category a certain weight. You'll get a good idea of who's who doing it that way. I'm glad LeBron's in the club. I mean, I always thought he was, but earning the Larry makes it official. I feel bad for the great players that couldn't get it done, but that's sports. Except Karl Malone. Eff him. only one player averaged a triple double for an entire season, and he played for a very mediocre team. oscar robertson was that player and without him the team was awful. he was the most complete player i ever watched in high school, college , and the pros. no player ever had any success trying to guard him or even slow him down.